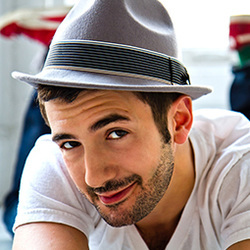 Al Blackstone - DWDE LTD.
﻿Al Blackstone is an NYC-based choreographer, performer, and educator, and the recipient of the 2011 Capezio A.C.E. Award for Choreographic Excellence. While working mostly in musical theater, his passion for contemporary and jazz dance enriches his unique approach to storytelling. In July of 2012 he directed, and choreographed the original dance narrative Happy We'll Be at the legendary Roseland Ballroom. Other original works include; an upcoming premier at University of the Arts, Hello Dolly for Dancers Responding to AIDS’ Dance From the Heart, the solos performed on So You Think You Can Dance by season 8 finalist Jess LeProtto, and Defying Inequality: A Broadway Benefit (cast of The Lion King). Theatrical credits include Sweet Charity at the John W. Engeman Theatre in Northport, Long Island (choreographer). Favorite performing credits: Wicked (Broadway and 1st National Tour), Carousel (Barrington Stages), the feature film A Winter’s Tale, NBC’s American Dreams, and TLCs Trading Spaces. He is also on faculty at Pace University in NYC.